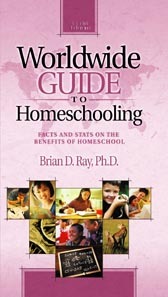 2005-2006 by Brian D. Ray, Ph.D.
Parents who are considering the benefits of homeschooling will find discussion and information in this book to help them make that decision. But many other categories of individuals will also benefit from this work. Curious journalists and other media persons, policymakers, legislators, professional educators, and doubtful grandparents can use it to understand homeschoolers and the homeschool movement. Marketing strategists can use the information in this book to reach the growing homeschool community. And researchers and homeschool leaders may use each new edition to stay up-to-date on the homeschool movement internationally. What are current trends in homeschooling, and what is its history? How are homeschooled students doing academically? Are homeschooled students getting into college? Am I capable, as a parent, of teaching my own children? What about teaching advanced subjects like algebra? How do homeschooled children fare in the “real world”? What about teenagers who want to homeschool? Is homeschooling right for us and our family? Supplemental information about key support organizations, publications, and services is also provided.